Gruesome murders, tabloid headlines and scandal. You could be watching the news, but this tale is set in the Windy City in the 1920s and has a terrific score to boot. Chicago, the Kander and Ebb classic musical with original choreography by Bob Fosse that took Broadway by storm back in 1975 and is still running there in the longest running revival in history (it won the Best Revival Tony in 1996). One reason this musical has enjoyed such popularity for so long has to do with that comment about the fact that you could be watching it on TV news today. The book (by Ebb and Fosse) is based on an earlier play by Maurine Dallas Watkins, a Chicago Tribune reporter, who had covered some sensational murder trials where the women accused became celebrities in the press. She based her play on those experiences, so a plot that otherwise might have seemed ludicrous is supported by realism. They soon are joined by Roxie Hart (Lynn Philistine), who shot lover Fred Casley (Jason Daniel Rath) before he could dump her. Her milquetoast husband, Amos (Ian Shain), tries to take the blame for the shooting when his wife claims she was attacked by a burglar, but changes his story when he realizes she knew the victim. The story is covered in a media frenzy led by reporter Mary Sunshine (operatic soprano Z. Spiegel) and Velma soon finds herself out of the spotlight now focused on Roxie (unfortunately the real spotlights on stage, designed by Marcus Abbott often leave the actors in the dark). The newcomer steals her sensational trial ideas, and even Billy Flynn (Christopher Sutton), the hotshot lawyer she secured with the help of a bribe paid to the prison’s matron, Mama Morton (Sheniqua Trotman, who returns to the Playhouse where she wowed as Effie in Dream Girls). As Billy crafts Roxie’s defense painting her as a poor victim of circumstances and Amos as an unsympathetic husband, another sensational triple murder committed by Go-to-Hell Kitty (Sarah Mozelle Waxman) threatens to take attention away from Roxie and her hopes for a Vaudeville career post trial – until she comes up with an even more sensational twist to tantalize the press and get her picture back on the front page. Another reason this musical endures through the decades is the fabulous score by Kander. Tunes like “All that Jazz,” Razzle Dazzle,” Nowadays,” “My Own Best Friend” have been a part of the Broadway song book ever since Gwen Verdon (Roxie) and Chita Rivera (Velma) introduced them in 1975. We were thrilled to hear Ann Reinking (who had been married to Fosse and won the Tony for her choreography) and Bebe Neuwirth (who also won a Tony) sing them in the revival. · Young Shain is miscast as Amos. Though he executes the song “Cellophane” well vocally, he is too nice looking. Amos should be sort of heavy and dumpy so we understand why the man is ignored by anyone. Shain is rather too attractive to have that problem. 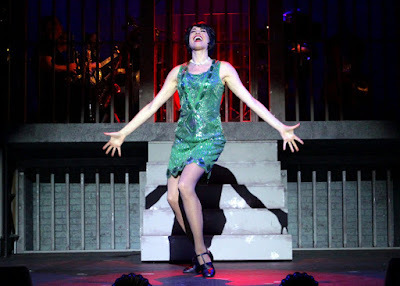 · Somehow Billy Flynn is missing that old razzle dazzle – along with some of the dialogue in this show, which sounds like it is being delivered by rote. Underwood needs to sharpen it. A scene between Mama and Velma, for example, as they reflect on the lack of “Class” people have, should elicit lots of laughs, but instead, it just gets a few chuckles. In another scene, a secret is revealed, but it goes almost unnoticed. A small band directed by Paul Feyer sits on a platform over the action on stage behind jail cell bars – kudos to Set Designer Martin Marchitto. Costume Designer creates sparkly, risqué costumes as well as period clothing and wigs to remind us we are in the art deco era and not in present day. “Cell Block Tango” is nicely staged and sung. Do yourself a favor. Turn off the election coverage and head on over to Ivoryton for some really sensational headlines set to fabulous music.